Normandy Park is a waterfront city of 6,500 residents on the Puget Sound in western Washington. It is a part of King County and is bordered by the cities of Burien, Des Moines, and the SeaTac International Airport. 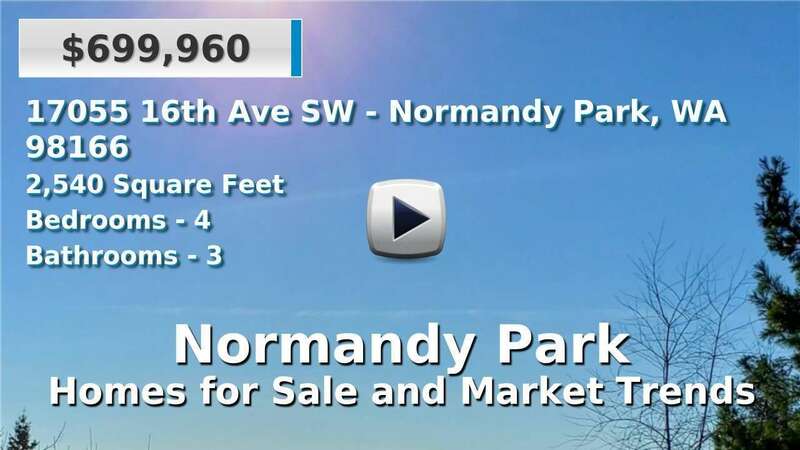 Normandy Park is conveniently located between the major city of Seattle and Joint Base Lewis-McChord, the Pacific Northwest's premiere military base. There is an equal mixture of older and newer homes for sale in Normandy Park, and many offer waterfront views or property. Residents have a typical drive time of about 22 minutes. 4 Beds | 3.5 Baths | 4798 sq. Ft.
4 Beds | 2.75 Baths | 3180 sq. Ft.
2 Beds | 2.5 Baths | 1295 sq. Ft.
5 Beds | 4.75 Baths | 4350 sq. Ft.
5 Beds | 4.5 Baths | 6548 sq. Ft.
4 Beds | 3 Baths | 6860 sq. Ft.
4 Beds | 2.5 Baths | 3180 sq. Ft.
4 Beds | 4 Baths | 3280 sq. Ft.
7 Beds | 4.75 Baths | 13007 sq. Ft.
5 Beds | 2.5 Baths | 3850 sq. Ft.
4 Beds | 3.25 Baths | 4230 sq. Ft.
4 Beds | 3 Baths | 4290 sq. Ft.
5 Beds | 3.5 Baths | 5500 sq. Ft.
4 Beds | 3.5 Baths | 3150 sq. Ft.
3 Beds | 1.75 Baths | 3122 sq. Ft.